This is another guest post from Dan on the best AA batteries for photography. You can read also his previous Fuji X100 and Olympus ZX1 reviews. You can follow Dan on twitter @ZDP189. I seem burn through batteries at an alarming rate. I have lots of devices that take AA batteries and none more so than my Speedlites. The Canon 580 EX II is a beast of an external flash and it drinks energy like a dehydrated camel knee deep in Lucozade. For some reason Canon still haven’t moved onto Lithium battery packs and so I have to keep dropping in AA batteries. There is a bewildering array of batteries available. Here’s my story; it’s a typical consumer tale of woe, but there’s hope. I started out buying AA (LR6) batteries at the grocery store. Today, these cost about ten dollars for a bumper pack of 20 batteries. That would last my family anything between a couple of days and a couple of weeks, but usually the battery drawer would be empty when I needed to grab a handful to shoot with. I started stashing batteries. I think we all did. We’d have our own little hoards, so when the new batteries came in with the shopping they’d all be gone in a flash. As a kid and young adult, started using NiCd rechargeables for high drain motorised applications like remote controlled cars and Airsoft guns. I still use them on most of my cordless power tools. NiCd batteries can deliver very high current and therefore promise fast recycle times. In fact, some flashes and electronic devices can’t use NiCds as the high current can damage circuitry. Most external flashes that I have checked are OK with NiCd though. However, I never liked NiCd. I found these batteries finicky and short lived. The capacity doesn’t give enough shots and it gets worse when batteries start getting the ‘memory effect’ and other kinds of abuse that are normal consumer behaviour. After flirting with NiCd rechargeables on an off I changed to NiMH when that technology matured, but the situation wasn’t much better than with alkalines. First, I found that I needed lots of them. I needed enough for three sets of flashes at four batteries apiece, plus some back-up sets, then enough for various other devices and a dozen or so to be left charging while I was out. Then I’d forget to use a set for months and it’d lose its charge and wouldn’t work again. I had lots more rechargeable NiMH batteries on hand than I ever did alkalines and an unknown number of them became duds. Performance suffered when the duds got mixed in with good batteries. In retrospect, I probably needed a sophisticated battery conditioner/ condition monitor and a regime for proper battery care, but to sum up, they were a hassle, they didn’t hold a charge, they were unreliable and I didn’t enjoy any economy over store bought alkalines and returned to using those. Over the years I discovered that there’s not a whole lot of difference between different brands, notwithstanding special grades and premium chemistries. Recently, I also found out that I could buy alkaline batteries wholesale as long as I was willing to buy hundreds at a go. For about the price of 60 Duracell Coppertops in a store, I could get a tray of some 400 GP brand batteries at something like 6.5 cents apiece. They all seem to work well. Anyway, anyone should be able to find a deal in the same price range locally or online. This discovery totally changed the game for me. They have several years of shelf life, don’t require any special effort on my part, and as long as they’re not costing me much then I should be satisfied. What bothers me is that all my research shows that NiMH should be a lot better. I am at a crossroads. Should I go back to NiMH? Alkalines work best at low working currents, such as 100mA. At low currents, an alkaline battery has a similar capacity to a full and well conditioned NiMH rechargeable. When the current drain rises, the battery drains faster and you won’t get as much energy as the rated capacity states. At 500mA, capacity drops by about a third, and at 2A, capacity is typically about half the rating. A Canon Speedlite, or almost any high guide number external flash will drain current as high as alkaline batteries are able to provide. NiMH batteries are much less affected by current and can provide a higher current than any alkaline battery. Indeed, NiMH batteries have a lower internal resistance than alkaline batteries and can deliver higher current, making for faster cycling times. While memories of poor past experiences haunt me, I am told that NiMH has evolved. There are now Ultra Low Self Discharge (ULSD) batteries such as the Sanyo eneloop brand that can hold a charge for months, even years. I should look into it again. Forward to rechargeable Lithium Ion, Lithium Polymer and LiFePO4? As a ‘flashlight freak’ with many friends in the industry, I am aware of Li-ion and Li-Po batteries and I have seen how they have revolutionised high power LED torches. It seems obvious that these may hold a lot of promise for flashes. Most of my devices already run on Lithium rechargeables, so it’s mostly the Speedlites that I need AA batteries for these days. They have higher potential discharge current, are less affected by cold and have a higher capacity. On the other hand, if used improperly, they could damage the equipment, explode, be over-discharged and pragmatically speaking, I don’t know of any AA-sized batteries that are 1.5V, only 3.7V like almost all lithium batteries. The only product I can think of is the RCR-V3m, which is a rechargeable lithium battery in a double AA pack in a reversed side by side configuration. Maybe that might fit into a Speedlite? Unfortunately I heard that these don’t deliver the performance I’d have expected them to. They have substantially less real-world capacity than NiMH. RCR-V3 batteries like most rechargeable lithium batteries take 7 hours to recharge, unlike NiMH, which recharge in two hours or less and are a heck of a lot cheaper. LiFePO4 is another lithium technology that can be fast-charged and holds promise, but I’ve yet to hear of an AA-compatible implementation. NiZn is an exciting development, but I’m cautious and I want to hear of other users’ experience first. The only maker I have found is PowerGenix . They are supposedly super fast, cycling a Speedlight SB-600 in under two seconds, which makes them faster than alkaline, NiMH and NiCd. They recharge in an hour and a half too, much faster than Lithium rechargeables, although the tested capacity is less. They’re expensive too and require a special charger. The biggest worry is that while they were designed to replace AA alkalines in digital cameras, the rated voltage is a little higher than alkalines and there have been reports of Speedlites getting burned out, though whether this is due to their voltage or the high amount of full power flashes that they can allow the flash to discharge is debatable. What about the other non-rechargeable technologies? 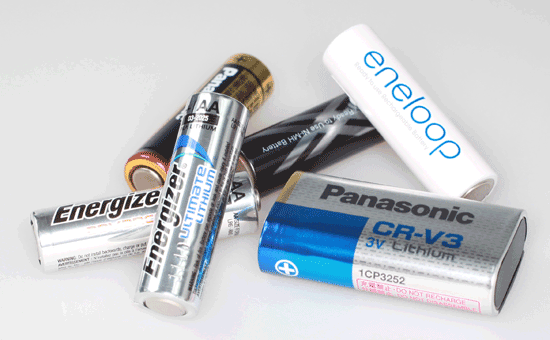 Some grades of non-rechargeable AA batteries last a lot longer than your common-or-garden alkaline. Energizer Titanium and Energizer Lithium have been independently tested to outlast by approximately 2 and 4 times longer than regular alkaline batteries respectively . According to batterydata.com, “These AA cells have a very long shelf life, a negligible self-discharge rate, excellent low-temperature performance, a flat voltage curve, and are capable of providing the high current needed for fast recycling of the camera flash.” That makes them ideal for lightly used digital cameras or devices that need a long standby, such as a spare camera kept in the car or a cabin, but uneconomical for kids’ toys, digital cameras and flashes. That’d be great if they weren’t so expensive. It would seem that fast chargeable ULSD NiMH is still the best option for people that want the maximum in performance, coupled with convenience. The downside is I need a maintenance regimen and careful recharging batch management. Alkalines can be bought very cheaply, but I’d go through a lot of them. Instead these (or non-rechargeable Energizer Lithium batteries) make good standby batteries in devices that sit idle most of the time and aren’t performance-critical, like my girl’s Yashica digital camera, her wall clock, or electronic piggy-bank. I’m still undecided about rechargeable lithium and Nickel Zinc technologies. They have great potential, but they also have their own technical drawbacks, economic disincentives and risks. An alternative way of getting more capacity and a faster recycle time is to buy an external battery pack like a Canon CP-E4, Quantum Turbo 3, Lumedyne HV Megacycler, or a Chinese model like the Yongnuo SF-18 or Nissin Power Pack PS300. Although sometimes I seem to spend more time charging batteries than actually enjoying my cameras, I make no claim to be a battery expert and I would very much like to hear your advice. What do you use for camera equipment of all kinds that take generic AA batteries? How do you cycle your flash and what experiences have you had? In the course of researching, testing and writing this article I have learned a lot about NiMh batteries and how to get the best performance out of them. A large part of my bad experience could well be due to poor practices. Here’s what I’d do typically: Buy batteries. Charge them in the charger (2 hours till the light goes off). I would use them in the flashes up to 6-7 times normally then stick them in a drawer. Months later, I’d try to charge them again, but they wouldn’t work. At least I knew not to mix brands and capacities, but it’d be hard to remember what cycles each one had previously. I have since spoken to some experts described my trouble and asked for advice. It seems I was killing my batteries. Here’s what I was told to do: On advice, I bought only ULSD NiMh batteries. Regular NiMh batteries are just as good if they are used frequently, but ULSD makes a lot more sense for my patchy usage regimen. NiMh batteries drain themselves if not recharged and when they totally run out of juice, they are really hard to bring back to life. The second generation of Sanyo eneloops are designed to hold 75% of the charge for up to 3 years, compared to a week or two for normal NiMh batteries. In order to get the most out of my batteries, I picked up a tricked out battery analyser-conditioner. I bought the Powerex MHC9000, a computer controlled device that offers customisable regimes for all the processes that I’d need and more besides. I paid fifty dollars. That sounds a lot for a charger, but it’s not much compared to most camera equipment. I have not tried other models and I other devices may be just as good, so I am not recommending it per se, but I seem to be getting along with it quite well and the English instructions are clear and explain the theory well. The first thing I did with the new batteries is to break them in, a process known as forming. My Powerex has a special mode for this. What it does is charge the battery for 16 hours at a low current equivalent to tenth of its rated capacity (250mA in the case of a 2500mAh battery; this is known as “0.1C”). Then it rests the battery for an hour and discharges it at a rate of 0.2C and finally it recharges the battery at 0.1C again. This whole process can take almost two days, so plan ahead if you have a shoot coming up. Next, bear in mind that a battery may last 500 to 1500 cycles but only reaches its peak performance around three cycles after forming. It’s not strictly necessary, but I am cycling the batteries twice more in the battery conditioner prior to use. That means a full recharge-discharge-recharge-discharge-recharge on top of the forming cycle. Charge if used frequently (every 2 weeks at most*) – Charge at 0.3C to 1.0C. *This is for standard NiMh batteries. All I will do to adjust for ULSD NiMh batteries ignore the storage times and presume that the batteries were ‘used frequently’. I used to try to avoid mixing NiMh batteries. I developed strange almost paranoid habits. I would keep a set together and only use them at the same time in the same device. If a device needed only one, two or three batteries out of a set of four, then tough luck, I’d use alkalines instead. There is some truth in this. If one or more batteries has a low voltage, low capacity, or high internal resistance, then as long as the batteries are in series, the device will only work as well as the weakest battery. Luckily, I now no longer have to be quite so careful; I can use the analyser to figure out if one battery has become worse than the others. The battery analyser-conditioner not only charges and conditions, but also reports the voltage and capacity of the battery. Therefore, as long as I don’t mix brands and models, I believe that I will be able to mix and match to an extent by making sure the charged batteries have a roughly equivalent capacity. While I have developed a lot more confidence in my understanding of rechargeables, my backups will remain alkaline. If I have to fall back to a backup, I want the security of knowing they’ll be good to go. For reference, I timed how long it would take for various batteries to cycle an Olympus FL-36R at full power. I cycled twice, then average the times for the next two cycles. This entry was posted in PR reviews and tagged Guest posts. Bookmark the permalink. Trackbacks are closed, but you can post a comment.